Works quickly. Best overall combination of effectiveness and affordability. Effective formula attracts voles, lacks all weather potency. Easily applied and maximally effective in small homes. A vole is a small rodent relative to a mouse that can quickly reduce the value of your home and the integrity of the furniture, possessions and the people who occupy it, not to mention what they can do to your garden. We have collected the top 3 best vole poisons, so you can put an end to the frustrating little rodent. Which Vole Poison Should You Choose? Must be applied several times. Tomcat All-Weather Bait Chunx are as effective at killing voles and other rodents as its name implies. Tomcat All-Weather Bait Chunx is manufactured from human food-grade ingredients to be extra enticing to rodents. 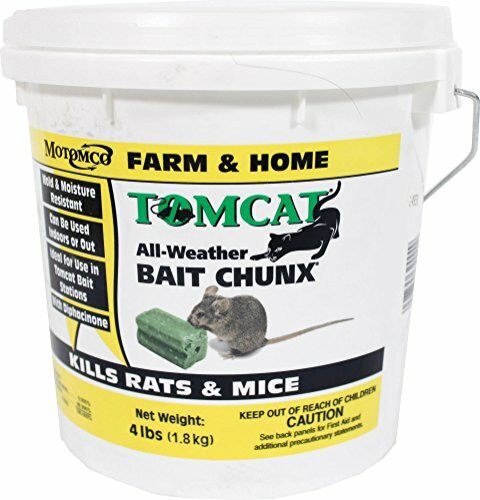 Tomcat All-Weather Bait Chunx is as effective indoors as it is outdoors, but when combined with the available Tomcat Bait Traps the Tomcat All-Weather Bait Chunx are irresistible to voles, mice, and other rodents. What’s more, Tomcat All-Weather Bait Chunx is moisture resistant and will not wash away after rainfall. Simply apply the bait to the infested area and sit back as your vole problem quickly disappears. Tomcat All-Weather Bait Chunx is also affordable. 4 pounds cost less than $30 which is quite the value considering its potency and effectiveness at destroying vole infestations. Tomcat All-Weather Bait Chunx is not safe for use around pets and children, so keep the kids indoors and well away from areas containing the bait. It is recommended that Tomcat All-Weather Bait Chunx be applied several times until the vole infestation has been completely eradicated. The runner-up to Tomcat All-Weather Bait Chunx is the JT Eaton Bait Block Rodenticide Anticoagulant Bait. The active ingredient in The JT Eaton Bait Block is Diphacinone. The anticoagulant bait prevents the rodents blood from clotting, efficiently eliminating smaller rodents and pests in just a few days after feeding. The JT Eaton Bait Block has a far-reaching scent that can be detected by voles anywhere in the vicinity, thus increasing the maximum effective range of the vole poison. The JT Eaton Bait Block is specially formulated with peanut butter flavored ingredients to make it irresistible to rodents and voles. 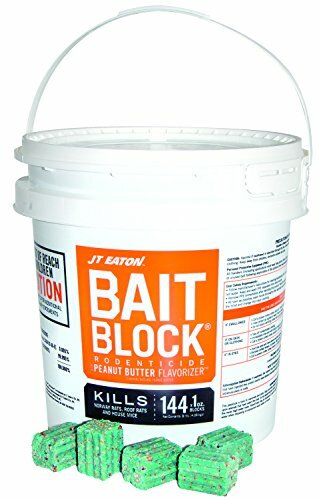 The JT Eaton Bait Block includes 144 packs of rodenticide blocks in a tamper-evident black that can be placed in garages, basements, or anywhere infested by voles. What’s more, the JT Eaton Bait Block includes a 1-year warranty should it not perform exactly as advertised. The JT Eaton Bait Block is not safe for use around pets and children. Sweeney’s Mole and Gopher Poison works exceptionally well on voles. Voles create snake-like tunnels in gardens and lawns that are unsightly and tedious to mend, similar to moles and gophers. Sweeney’s Mole and Gopher Poison is applied via a yellow cone-shaped applicator. The applicator is placed in the tunnel created by the rodent and physically prevents the tunnel from further use. Once in place, the poison is triggered to eliminate the vole. 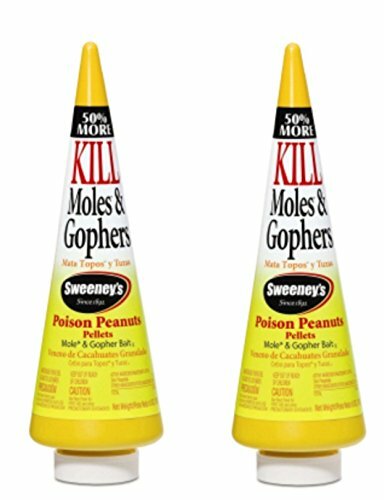 Sweeney’s Mole and Gopher Poison comes in a convenient 2-pack and is ideal for everyday application. Sweeney’s Mole and Gopher Poison is highly effective and highly affordable. The 2-pack is available for less than $20 and ideal for small volume applications. Gardeners and yard owners will rejoice after seeing how quickly and effectively the Sweeney’s Mole and Gopher Poison eliminates voles and just about every other type of rodent. Regardless of the size of the yard, home or infestation all of the vole poisons on this list do their job exceptionally well. The vole poison that you choose will be determined by the size of the vicinity infested with voles and approximately how many voles are included in the infestation. Pait packets work best for medium to large applications such as homes and yards. Bait blocks are the ideal application for large to extra large applications such as large properties, barns, parks and golf courses. Cone baits, however, are ideal for small applications like gardens and small yards that are only infested with a small number of voles. A vole can create hundreds of dollars in damage should they get into your home and begin foraging in your walls and furniture. Bait packets are the best way to address a vole infestation in the house. They not only attract voles, but they can be strategically placed to lure voles away from your home where they are eventually killed by the bait packet. Bait packets are also highly effective when utilized in conjunction with a professional exterminator who will know precisely where to place the bait in order to increase its maximum vole killing effectiveness. Though bait packets are effective, they do need to be regularly monitored and reapplied to ensure the entire vole population has been eliminated. Bait blocks work exceptionally well on large farms or in garages and barns where there is a lot of space for voles to occupy. Bait blocks enable greater bait coverage and generally permeate a stronger scent then bait packets. The voles can smell the scent from farther away which means less bait is required to achieve maximum coverage and effectiveness. Bait blocks generally also include an anticoagulant which is extremely effective and quick at eliminating voles, rats and other rodents. Cone baits are an innovative solution to a frustrating and unsightly problem created by voles and other tunneling rodents. By obstructing the voles tunnels, the cone bait not only prevents the vole from entering your home and garden but eliminates them shortly after contact with the bait. Cone baits are also ideal for small applications where only 1 or 2 voles may be plaguing a small garden or home. Cone baits are also very affordable and easy to regularly apply to your lawn. Few, if any rodent baits and poisons are safe to use around pets and children, so it is important only to apply vole poisons where there is no chance of contact with each. All of the vole poisons presented on this list are exceptionally powerful and effective against voles and other rodents; however, the best overall is surly Tomcat All-Weather Bait Chunx for its seamless combination of affordability, maximum range, and effectiveness. However, when it comes to a precise application, there is no beating the vole stopping power of Sweeney’s Mole and Gopher Poison.